Video Poker was implemented as a casino game after the so called club poker started to became more and more popular. Similarly as it is with many casino table poker variations, owners of gambling venues were looking to draw punters into a game where they would actually gain an edge and make money of their losses, instead of only making a little portion of money for hosting the game as it is in club poker. Video Poker is very similar to the slot machines and this game is actually also a gambling machine that uses random number generator to visualize cards on the screen. These are played by gamblers inserting money into the machine or depositing it and then wagering onto a particular hand, just like money is wagered on spins when playing slots. So lets take a look at how video poker machines are played and how you can start to do so. As we will concentrate on playing these machines online, most things in this article will be geared towards online play. That’s not to say that you can’t use them when playing in a live environment though. A single hand of Video Poker starts with you choosing the size of your wager and hitting the deal button. You will then be dealt with 5 cards from a 52 card deck. Some types of the game will also include Jokers into the play, but lets assume you choose the most popular variation of the game – Jacks or Better. Now when you are dealt the 5 card hand, there is a decision presented to you – each of those 5 cards can be either held or exchanged for new ones. Usually players are advised to hold cards that make at least a pair of Jacks, 4 to a flush or to a straight given that the likelihood of you hitting that actualy hand is high enough to do so. Once you’ve decided which cards to draw and which to hold, the drawing occurs and you are dealt with new, replacement cards for the ones you choosed to exhange. Now the payouts are done according to the payout chart. 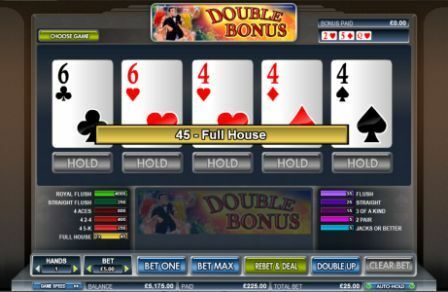 Note that different types of the game might have different payout odds for hand combinations like two pair, flush and full house. As I already briefly mentioned, there are a handful of Video Poker Types offered that differ by payouts and specific rules. Some of them will have deuces as wild cards, replacing any other ones and awarding a huge payout for getting 5 of a kind (quads and a deuce), while others will offer a progressive jackpot for hitting a royal flush. Most of the types, though, are just duplicates of others and won’t really come off with anything innovative. As the majority of people like to try out new things that differ from what they have been routinely trying, I have decided to concentrate on Video Poker games from two online software developers – MicroGaming and Cryptologic. Both of them hold a number of trully one of a kind type video poker games in their portfolio and also stand out with exceptional quality user experience. Here are the types we currently have on the offer for free play as well as a brief review regarding the unique features associated with each. 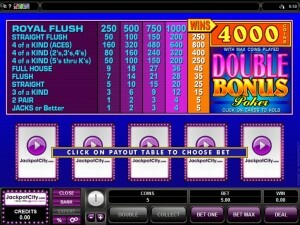 Even thought just about any online casino offer video poker as a part of their offerings, we had to choose online one. That was quite a task as all of our partner casinos are big industry players and offer exceptional playing experience. The best one of them all happen to be Jackpot City that is the most known brand powered by legendary Microgaming casino software. You’ll find over a dozen types for Video Poker with a handful of them being quite unique, such as Super Jackpot Poker. Apart from the game variety, we have also secured an exclusive bonus with them – 100% match, up to $1600. This replaces the regular $500 bonus, so take advantage of it right away. Join JackpotCity now and play over a dozen Video Poker games online!